As I write this blog, six people have been killed in a derailment accident in Bihar two days back. Condolences to the families of the bereaved and its unfortunate that such an accident even happened. Am sure the Railways will find the root cause and fix the issue. With the general elections looming over us, there will be sabotage and manufactured chaos by several opposition parties because their very existence is under threat as the Modi magic continues unabated. A couple of weeks back, the Railway Minister, Mr. Piyush Goyal tweeted about elimination of all the unmanned railway crossings in the country. 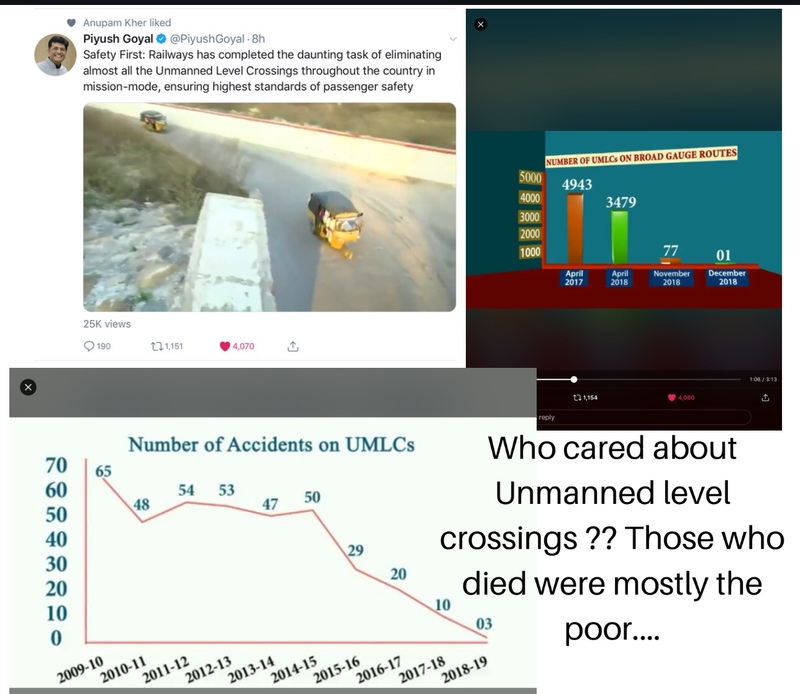 As expected, it didn’t create a flutter because people who got killed at these unmanned crossings were usually villagers and the poor… so who cares ! Also a couple of weeks back it was more important for the country to know how similar Priyanka Vadra’s and Indira Gandhi’s noses were. That brought TRPs, unlike the ones who got killed at these unmanned crossings, unless they happened to be from some vote bank. Well, with the removal of the last unmanned railway crossing, the opportunity to use any death for political gains is lost. And precisely for this reason, I will vote for Mr. Modi again and again… this government does things that don’t necessarily benefit a certain vote bank but are required and important to the country as a whole. We can argue that 63 people dying in one year in a 1.2 billion people country is really a speck of dust but for the families of those 63 people, its a disaster ! Could this have been done by the previous governments ? Ofcourse, but who cared enough ? This just wasn’t a priority. These unmanned railway crossings were vestiges of an old era and not something that modern India should be living with. Glad that they are gone. Thanks to Mr. Piyush Goyal, who is turning out to be a rockstar minister whatever be the portfolio – more power to him (pun intended) and his kind. To get people like Piyush Goyal as ministers, we need Mr. Modi as the Prime Minister again in 2019 :):).